What Exactly Do Toners Do … And Do You Really Need One? When you think about toners, you might initially think about an alcohol-based product that leaves your skin feeling tight and dry, a step you might want to skip in your routine. Alternately, you might think that that tight, dry feeling is exactly why you like using a toner. When we talk about toners in the Korean skincare routine, though, we’re talking about Korean toners, which are different from Western toners. They’re milder, gently formulated as Korean skincare tends to go, and they provide that first layer of hydration in a skincare routine. Principally, though, toners are formulated to do one thing: to balance the pH level in your skin. Toners do two main things. Toners are primarily formulated to balance the pH level in your skin because cleansing can throw off that balance. We’ll talk in-depth about pH levels in another post, but, for now, basically, pH levels measure how acidic or alkaline your skin is — the pH scale is from 0 to 14, with 1 being most acidic and 14 most alkaline. A pH level of 7 is neutral, but healthy skin has a pH of 5.5, which is slightly acidic. Generally speaking, skin typically has a natural pH level of 4 to 6. Cleansing, often, throws skin off, usually making it more alkaline, so the principle task of a toner is to re-balance skin and return it to a pH level where skin can be most radiant. That means toners typically have a pH level that’s neutral or slightly acidic to help “balance” your slightly alkaline skin, post-cleansing. Korean toners, however, don’t typically just stop there. Peach & Lily founder and licensed esthetician, Alicia Yoon, tells us that, when it comes to Korean toners, they tend to be a bit milder and are designed not only to balance skin’s pH, but also to help skincare ingredients sink deeper into skin. In other words, toners help prep skin for the next steps that follow in your skincare routine! It doesn’t matter what skin type you have. All skin types should be using toner. It sounds like a superfluous extra step, but maintaining a balanced pH level is crucial to skin health. A healthy skin barrier helps protect skin from environmental stressors and keep skin hydrated, and a pH level that’s too acidic or too alkaline can eat away at the barrier, which can leave your skin open to irritation and breakouts. 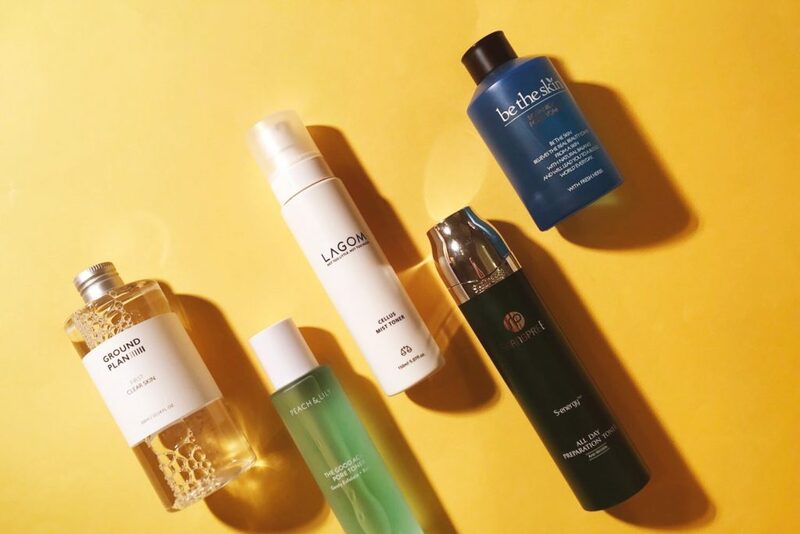 We personally like to shake our toner onto our hands and pat it into our skin, allowing our skin to soak in all the goodness these Korean toners contain. You can also shake toner onto a cotton pad and apply it by swiping it over your skin if you’d prefer that method — there’s no hard and fast right or wrong to it. You also don’t need to think of your toner as a kind of cleanser or pore decongestant to get any that “last bit of grime!” You’ll find that, if you’re cleansing properly, your skin has already been thoroughly cleansed and your pores cleared, so you can just approach toning as that balancing and priming next step in your routine! Here are a few toners we recommend! The Lagom Cellus Mist Toner is, well, it’s a mist, and we like that we can spray the soothing, hydrating toner onto our face. We do recommend making sure to pat the remaining mist onto your skin, so it doesn’t just evaporate into the air, taking moisture from skin with it. Shangpree’s S-Energy All Day Preparation Toner is an alcohol-free, non-irritating toner that’s suitable for all skin types. It even contains oxygen to help stimulate collagen production, along with super-hydrating, soothing ingredients like hyaluronic acid and aloe. The Peach & Lily Good Acids Toner also contains no alcohol and has been formulated specifically to help keep pores sparkly clean, with a formula that contains an AHA (glycolic acid) and BHA (salicylic acid) to provide gentle exfoliation while balancing the pH level. Ground Plan’s First Clear Skin also contains a BHA (wintergreen extract) to provide gentle exfoliation, as well as centella asiatica extract to soothe and calm skin. Be the Skin’s Botanical Pore Toner includes potent botanical extracts and witch hazel extract that make it particularly beneficial for acne-prone skin.